All dogs should go out at least three times a day. Your dog can't tell you he has to pee -- not in English, anyway. His body language speaks volumes, so you can identify when he's ready to burst and get him outside. One way to tell if your dog has to pee doesn't require even being around your dog -- just look at your watch and count back how long it has been since he took a bathroom break. 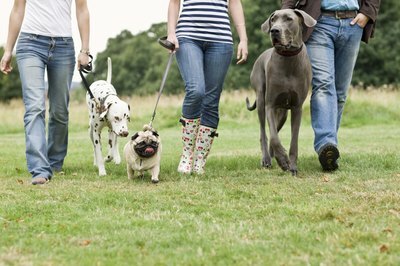 While it varies depending on factors like size and age, generally, an adult pooch should go outside between three and five times a day. That means if it's been more than a few hours since his last break, it's getting close to time for another, especially if he's had a nap or a meal since then, as waking from slumber or drinking water can make him have to go. Dogs often sniff around before urinating, both inside and out. Their noses are more sensitive than ours, and they use them to figure out the best place for doing their business. If you notice yours sniffing around the ground for more than a few seconds -- especially if his nose is leading him all over your home -- he may be hunting for a good spot to squat or lift a leg. Get him outside and let him finish sniffing there. A house-trained dog knows he isn't supposed to pee indoors. But when he's gotta go, he's gotta go. If your dog suddenly leaves the room, he could be trying to find a secluded place to pee where he hopes you won't notice. Make sure to keep your dog in your presence. You'll notice when he fidgets and goes off with purpose but no discernible reason, he could have something to hide -- literally. Dogs get excited for a lot of reasons, such as when you come home from work or when you drop a piece of cheese on the floor. Acting restless, though, without such a stimulus, may be his means of telling you he's ready to go outside. A dog who's staring, whimpering, circling or just plain needy is like a toddler doing the pee-pee dance -- he has to go to the bathroom and just can't hide it. What Causes Your Cat to Act Strange?